So if you are considering bankruptcy, you should know that you are not alone. Knowing the causes of bankruptcy may help you identify financial problems early and take control of your debts before they take control of you. It is a myth that bankruptcy is always a result of something you can control. Often the causes of bankruptcy are not something we bargained for. This may include a major car or home repair, a house fire or even something as catastrophic as a death in the family. Without adequate savings and insurance, the cost of a major disaster can lead to bankruptcy. 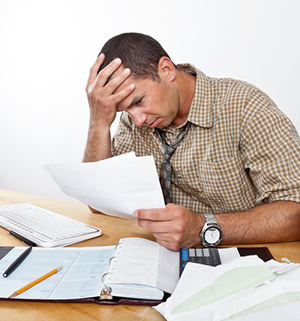 Losing your job can make it difficult for you to stay on top of your debt payments. Even if you are not at risk of losing your job, you may have experienced a reduction in overtime or a cut-back in your usual hours worked. Perhaps one family member has decided to leave the workforce for personal reasons. Whatever the reason, you are now forced to make ends meet on a reduced income. You may find yourself relying on credit cards to pay the bills. If you lose your job or have your hours reduced, it is important that you reduce your spending immediately. One of the best things that you can do to prepare for the disastrous effects of an income reduction is to build yourself an emergency fund. Even with government health care in Canada, a major illness, injury or other health related problems can affect both your income and your living expenses. Not all medical costs are covered by health care or insurance. You may have found it necessary to take time off work to recover from your health problems. Without supplemental insurance benefits, you may have used credit cards to pay for both your medical costs and every-day living expenses for a while. If you are unable to return to work, your disability income may not be enough to pay off your debts. There is little you can do to prepare for an unexpected medical issue other than ensure that you have insurance and adequate savings to support you for a short period of time. In addition to the emotional cost, the financial cost of divorce is quite high. As well as having to pay legal costs, former spouses now find themselves paying for the cost of two households instead of one, all on the same income. They may also find themselves paying extra legal costs related to the separation. It is not surprising that a 2010 report on the causes of insolvency by one of our Licensed Insolvency Trustees, Hoyes, Michalos & Associates, found that marital or relationship breakdown was the primary cause of bankruptcy for 14% of all bankruptcies. Over-spending and excessive use of credit is the number one cause of bankruptcy. In truth, having more debt than you can handle may have started out by over-spending or by poor use of credit card debt however we often find that in most cases the tip over the edge occurs when combined with one of the above causes. When you are heavily in debt, and do not have adequate savings to fall back on, an unexpected event such as an illness, job loss or divorce can bring an already risky situation to the brink. The best way to avoid financial mismanagement is to create a budget so that you monitor both your income and expenses and make sure that you spend only what you earn. It is also important to establish a savings plan for expenses that could lead to more debt. Regardless of your financial problems, there is a solution. Our local trustees understand that you may be experiencing trouble with your debt through no fault of your own. Contact a Local Bankruptcy Trustee who will review your situation and recommend a solution to your financial problems.